Athletes are increasingly using clothing embedded with sensors and biometric tools to measure their performance. But while the industry is edging closer to adapting these products for the mass market, the overriding challenge is the garments' washability. 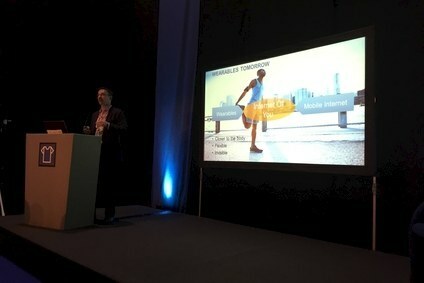 Although wearable technology is already integrated into garments for use in the professional sports sector, Martin Ashby, chief operating officer of smart garment technology specialist Smartlife, told delegates at last week's Wearable Technology Show in London that ultimately, what matters is how the information presented from the kit can be “transferred” for every day use by amateur sports enthusiasts. Technology “cannot replace full training staff and medical doctors,” agreed Markus Strecker, chief executive officer and founder of technology brand Teiimo, adding that it can help people who are interested in improving their fitness, such as weight management, and health issues. Yet the biggest problem holding back mass market adoption is the simple issue of washing the garments themselves. During the conference, experts faced questions on how the garments can be cleaned and how long it is likely to be before an all-in-one could pass washability standards without having to remove any parts. It seems the key issue is, understandably, the battery. According to Simon Weatherall, founder of wearable technology company Glofaster, waterproofing the circuits with a fine coating over the electronics is “possible”, but it is not cost effective. Thomas Claussen, CEO of Ambiotex, which has launched a smart shirt that measures biometric data, agrees that improvements to the batteries are key to future progression. Speaking on the sidelines on the conference, he said: "I predict in two or three years time the box", which holds the battery and the electronics themselves, "will evaporate. It will certainly get smaller as the batteries get smaller because the batteries determine the size, not the electronics." Ashby added that as the electronics in the Smartlife kit are IP6 integrated, the challenge experts face is not the water itself but the temperature. When designing garments for commercial use the product must pass tests of generally 50-60 wash cycles, but when the kit is treated at 90 degree temperatures and spun at 1000RPM, this is not a “usual usage case.” Ashby believes the units will have to be considerably more robust. While consumers are “not interested” in such details like their heart rate, he notes, the fact they are interested in “how they can change what they are doing in order to improve” demonstrates, along with the issue of washability, what wearable technology companies need to strive for in order to break into mass market. 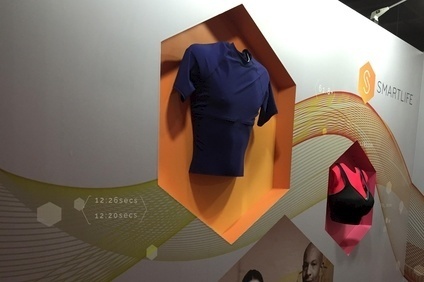 What next for smart fabrics and garments? Wearable Tech Show: Innovations and developments.